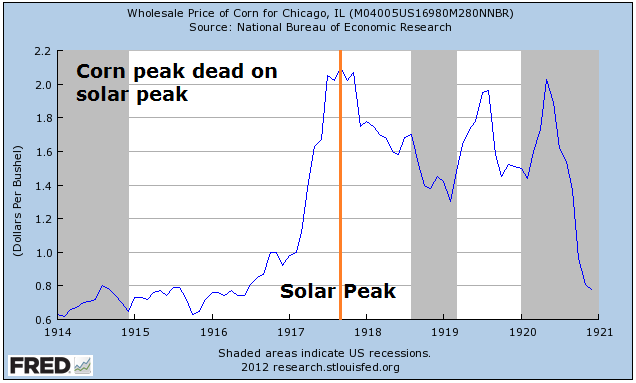 Today’s exercise is to look back in history at the previous secular commodity peaks of 1917, 1947 and 1980, that correlate with the solar peaks of August 1917, May 1947 and December 1979, and see how close to the solar peaks individual commodities peaked. This can then assist in expectations for commodities into and around 2013’s solar peak, which I suggest will again be the scene of a secular commodities peak. The data available is spotty, so I have to make do with a selection of four differing commodities for each of the 3 periods in history, but it is nonetheless a useful guide. Firstly, 1917. 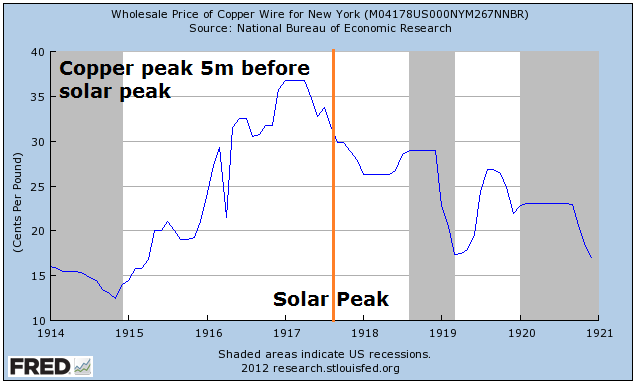 Copper, corn and wheat all peaked between 5 months before and on the actual official solar peak. 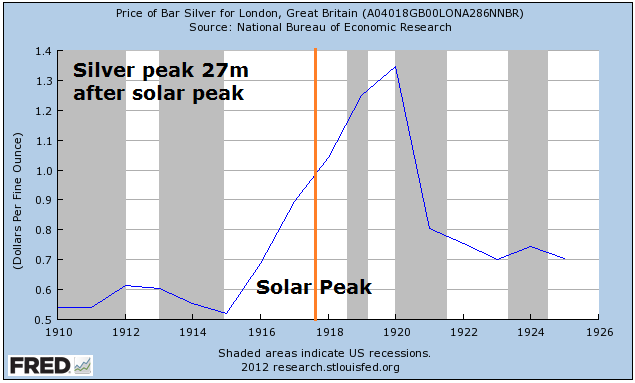 Whilst silver did not peak until 2 years later, its acceleration began around 12 months before the solar peak. Secondly, 1947. 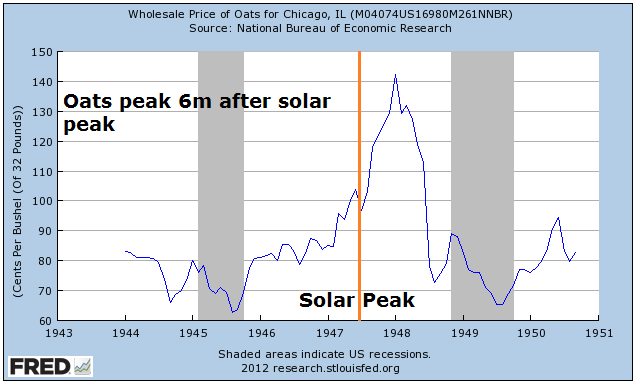 Oats, corn and wheat all peaked around 6 months after the solar peak. 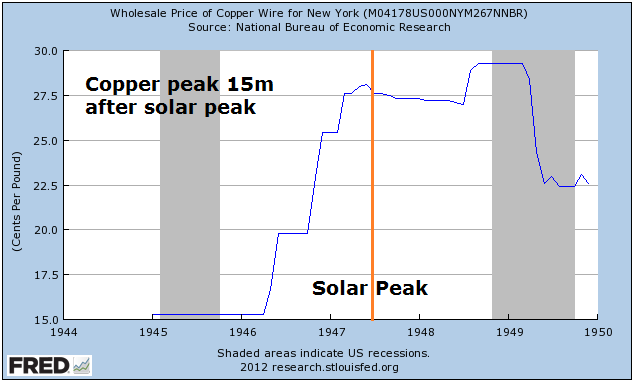 Whilst copper did not top out until 15 months after the solar peak, the bulk of its gains occurred in the run up into the solar peak. Thirdly, 1980. 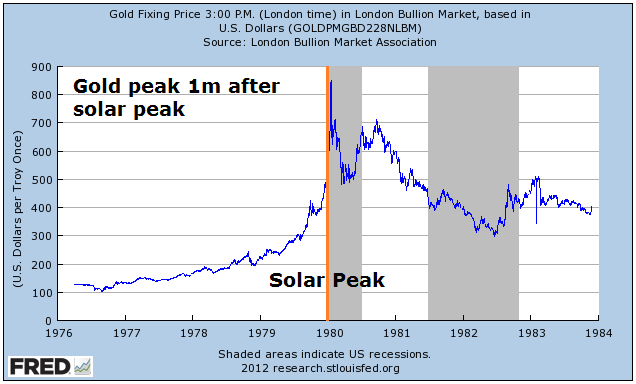 Copper and gold peaked with the sun, with oil and sugar peaking 4 months and 9 months after the solar peak respectively. On current forecasts, a solar peak should occur sometime between Q2 2013 and Q4 2013, with SIDC projecting nearer the former and NASA and Jan (of Sibet) closer to the latter. Based on the historical examples above, we might therefore look out for commodities making final parabolic tops as of the start of 2013, right through to 2014. 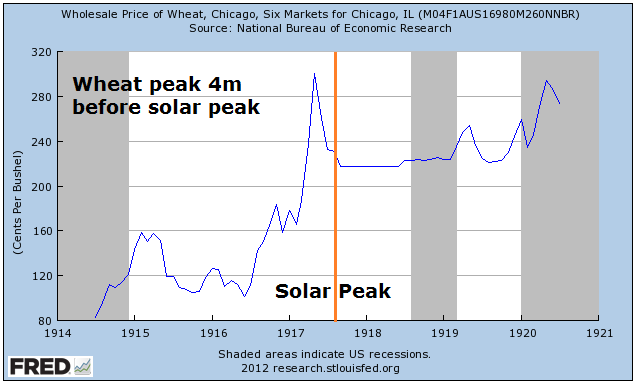 The bias from history is more towards commodity price peaks later than the official solar peak, so we might rather look to the second half of 2013 or even early 2014, subject to solar progress. To add to this, another look at the charts above shows that most of the commodities made a big acceleration of around a year’s duration before reaching their tops (or the solar tops). Right now, the CCI commodities index (a broad measure of commodity momentum) is some way beneath its 2011 high and not yet in a major acceleration. By Gann, that acceleration should just have begun, in late November. I believe Gann methodology to some degree reflects solar methodology, in that it draws together mirrors from history to predict the future – only by my reckoning, it is the influence of the sun that makes for these repetitions in time. Nevertheless, it’s a cross reference. One further conclusion from the above charts is that there was broad commodities participation in each period, so we might also expect the majority of, or even all, commodities to participate in a final ascent (though perhaps with a lag between individual peaks) this time round. If we consider our current period as a K-winter, similar to 1947, where gold is the lead asset, then nevertheless we can see back in 1947 a range of commodities also participated in parabolic ascents into and around the peak. Therefore, exposure to a range of commodities ought to serve well this time around, without the need to specifically cherry pick. To repeat, 2013 is a major test for my solar theorising. I consider I have a true sample of 3 from history (three secular commodities / solar peak correlations), which by any statistician’s measure is a fairly meagre sample, and a 4th would add substantial weight. However, when we draw in my historical correlations between solar peaks and secular stocks peaks, and solar minimums with crashes, panics and bottoms, the relations through history between secular asset cycles and solar cycles are more compelling and the sample significantly larger. 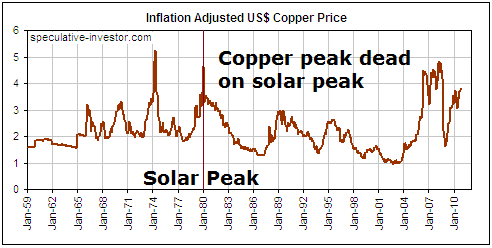 I also look on it another way, in that commodities secular peaks occur only every 30 years or so, and it has been amazing how close to solar maximums these secular commodities peaks have all fallen (including several exact hits shown above), given that huge window in time. 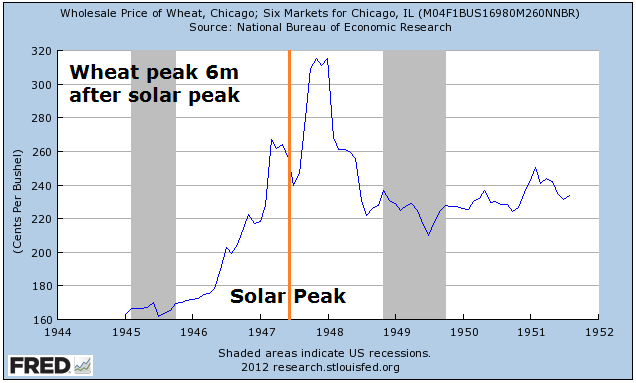 The validity of this current cycle is already partially formed in that commodities again broke into a secular bull market in the decade leading up to the solar peak and the secular commodities peak occurred at the earliest 2011 (until that CCI high is taken out), which is again close to the solar maximum, in the context of a 30 year cycle. But I maintain 2011 was not the high, and that the secular peak will be closer to the solar peak, and that the final parabolic ascent is right ahead. 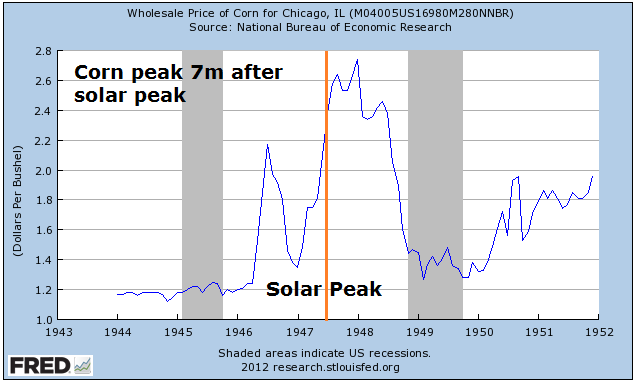 If commodities rather continue to rise for some years following the solar peak, rather than topping out with the sun, then that would of course reduce the validity. As fossil fuel exhaustion and natural resource scarcity are real threats, that could be caused by a paradigm shift whereby commodities are permanently repriced higher. 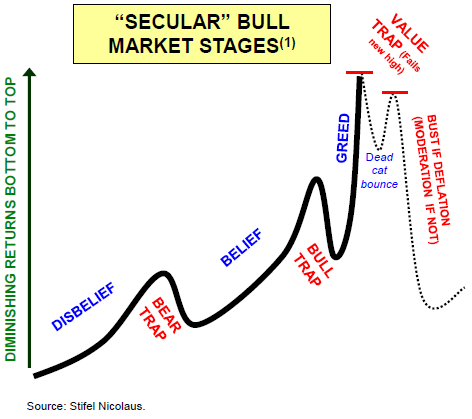 However, by my previous analysis, I do not expect that scenario in this secular cycle, but rather in the next secular commodities cycle of mid-century. I maintain a broad long commodities exposure, with the largest exposure in precious metals, but significant positions in energy and agriculture too. Tomorrow I leave Malaysia for Thailand, starting with 4 nights in Phuket. 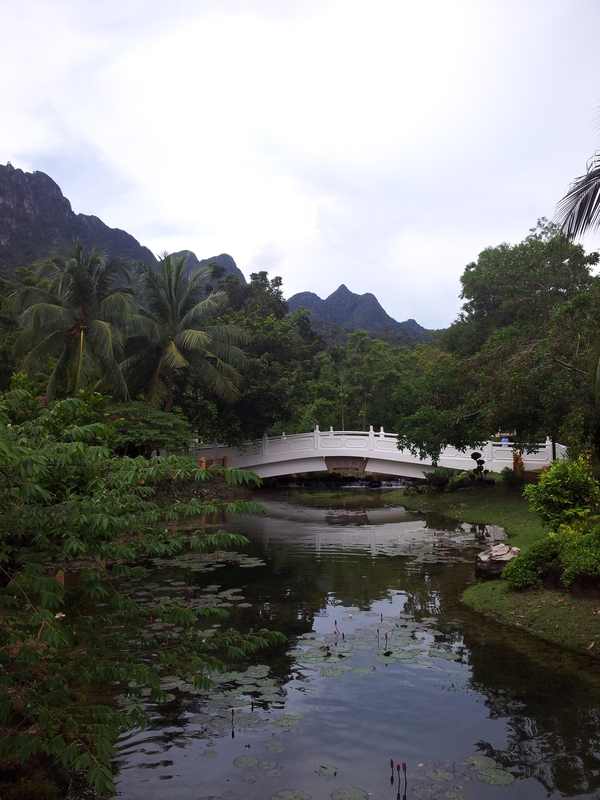 My Malaysian journey has been limited to Peninsular Malaysia (rather than Malaysian Borneo), taking in Melaka, Kuala Lumpur, Penang and Langkawi, and my overwhelming impression is the friendliness and peacefulness of the people. I found this most striking in Kuala Lumpur: a capital city where people are warm and respectful to one another is a curious and wonderful anomaly in my experience of capital cities. Now you are aware that I am accompanied by a family and that might influence the way people react and behave around me, so here is supportive evidence from a couple of studies. Malaysia also was rated the second happiest nation in South East Asia after Singapore, in the UN World Happiness Report (measured between 2005 and 2011). When I asked Malaysians why there was such apparent harmony and friendliness, the response was that this is a country of several peoples and cultures living together as one: out of the diversity has come unity (it is around 50% Malay, 24% Chinese, 11% indigenous, 7% Indian and 7% various others). Clearly, in other countries disparate groups living together has led to conflict and unhappiness, so whether it be cultural, religious, political or social influences at work, it is what is, and the Malaysian people made it a real pleasure to be in their country – so we have been in no hurry to leave. Even in the rawer parts of Kuala Lumpur, I found the atmosphere remained safe and respectful. Similar to Singapore, for an Englishman like myself, there is a nice blend of the familiar and the exotic. The legacy of British Empire rule is English language everywhere, driving on the left, UK plug sockets and the colonial-styled luxury of the Shangri-La in KL. Yet, the influence of Islam, the multi-cultural cuisine reflecting the multi-cultural society, the 30 degree heat, the tropical storms, the palm plantations, the rain forests, the monkeys and lizards, and the marine life on the reef all made for a terrific novel exotic experience. The icing on the cake was a cost of living that I found to be overall about half that of the UK – our accommodation, transport and dining. In an odd twist, eating out worked out cheaper than self-catering from the supermarket. How is that reverse premium possible? The Asian Banking Crisis of 1997 made for the biggest dip in economic development, but it fairly swiftly recovered to trend. Debt to GDP is around 50%, a manageable level. The housing market has been the 9th hottest real estate market in the world over the last 5 years, but property prices remain very reasonable relative to other hot property markets such as Switzerland and Singapore. The stock market (the KLCI) has also performed well, as shown below, but is currently valued at at p/e of 15 and a CAPE of 20, so does not represent an interesting opportunity at the moment. There is also a government scheme to encourage foreigners to live in Malaysia on rolling 10 year passes, with fairly low entry criteria compared to most other countries. Details here. Like anywhere, there are negatives, and the following are my such perceptions. Whilst the infrastructure and public transport is generally of a high standard, the common taxis are largely decrepit. Whilst the area of Kuala Lumpur around the Petronas Towers is very nice – there are large chunks of the capital city which are, to be blunt, an eyesore. 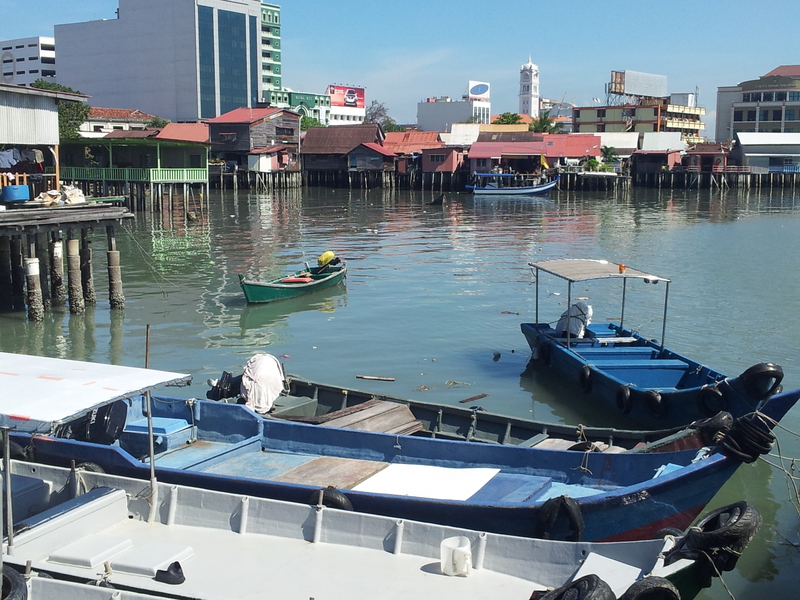 Whilst Penang is a cosmopolitan island with some plush developments, there is also a fairly large contrast there between the poor and the rich. The open drainage system throughout the country causes some bad odours, and capital punishment and certain particularly harsh laws may not appeal to everyone. As this is a country that can be currently considered in transition from a developing country to a developed country, it is easy to imagine some of these issues being resolved with continued growth. There is a lot of new build development occurring in Johor, Melaka and Penang – a lot of ambitious investment. I can contrast that with large parts of the UK where building has slowed to a standstill and high streets remain partially empty since the 2008 recession. All in all, Malaysia’s people, natural resources, sustained economic growth and investment, and geographic position in the world for this century (expecting Asia to lead global growth) make it an exciting and appealing country. I really can’t praise it enough. The CB leading indicators for Germany came in at +0.1 (previous month flat), and for USA +0.2 (previous month +0.5). The summary table is below and shows the overall positive global picture. 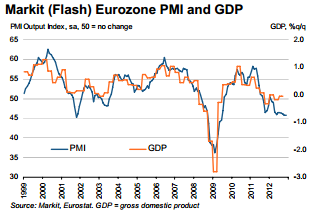 Next are the Markit PMIs released this week for the Eurozone, USA and China. 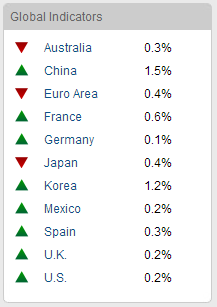 The Eurozone remains weak in this leading indicator, but USA and China both show pick up and positive readings. I maintain the opinion that leading indicators globally are overall showing renewed positivity, and that should bode well for risk assets into year end. Presidential seasonality and Gann are also supportive. To counter that, we have down pressure into next week’s full moon. 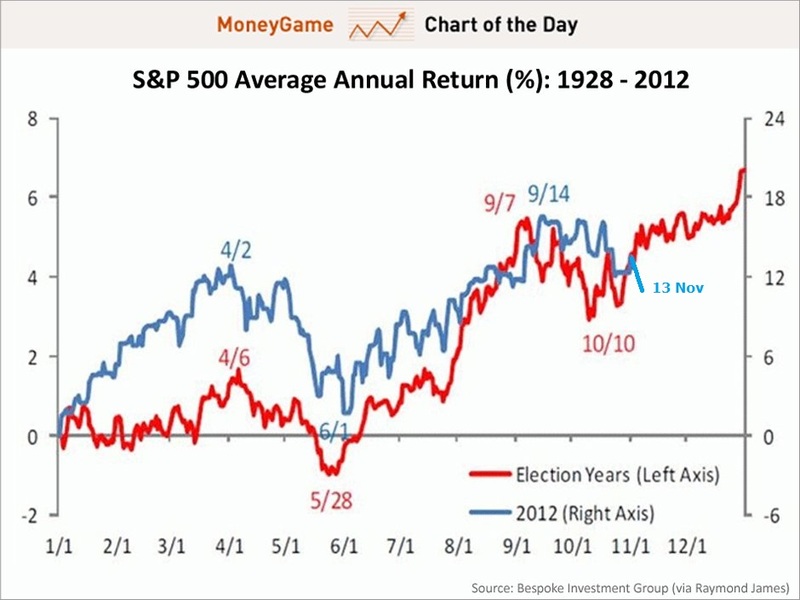 Today, the Friday after Thanksgiving, has a positive historical seasonality, but not Monday. Given the v-bounce in US stocks, I believe there are several reasons why the market may pull back next week, and the question is whether this produces a dynamic ‘W’ base from which to then rally into year end, or whether the market drops lower than the mid-November low and makes a positive divergence (or even lack of positive divergence). Below is the SP500. 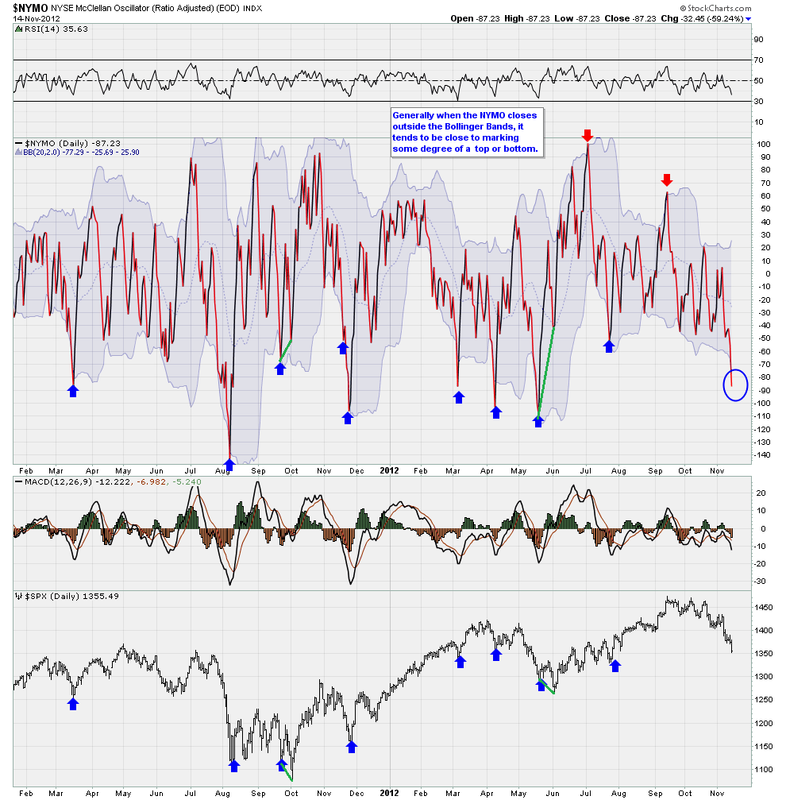 The overall wedge shape is bearish, but the market met twin support (shown) at the mid-November lows, together with bottoming indicators such as Nymo and capitulative breadth. A drop back to the lower support or just below, before advancing, or a move up to the top of the wedge for a slightly higher high (with potential negative divergences, if this were a topping process), would both be possible outcomes here. However, the swift reclaim of the 200MA this week could provide additional support for the market holding up here rather than dropping down to the lower boundary again. Next is the Nasdaq, which has been the neatest index technically since the cyclical bull began. Here again we can see the market reached rising support at the mid-November low. A lower low would therefore spell trouble, and, given the improving global picture ahead, and the normal topping process (push back up to the highs with negative divergences) if this index is already topping, then a higher low or continued uptrend seems more likely, in my opinion. Looking wider, I noted a few days ago that the Hang Seng was backtesting the breakout of its long term triangle, and it has since advanced again, suggesting a successful backtest. It’s still tentative at this stage, but looks promising. 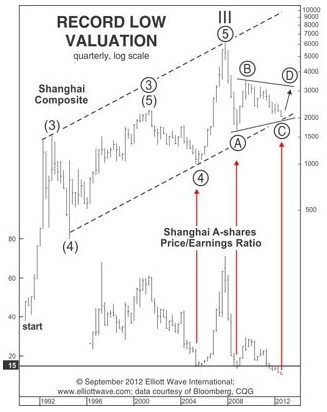 The Morgan Stanley China A shares ETF shows a tentative breakout from a declining wedge on positive RSI divergence. The UK FTSE is still within its long term triangle, but is again pushing back up towards the declining resistance. By solar secular history, a breakout would be normal, followed by a pullback towards the triangle nose, before secular bull momentum begins – all taking place over the next 18 months or so. The German Dax remains technically bullish. 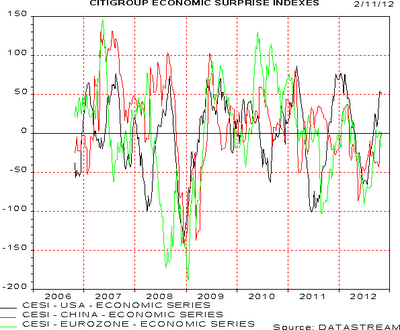 Various supports and resistances are shown, with the Dax flirting with breakout of the longer term resistance also. Looking at other assets, gold is looking technically positive to eventually make new secular highs. A breakout upwards out of the 11 month consolidation (shown), and a bounce above the 200MA again, which has largely supported the secular bull to date, are evidence for this. 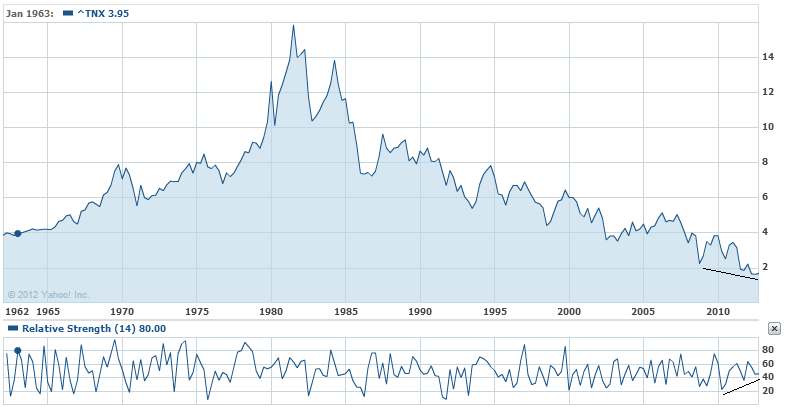 We are in a positive seasonal period of the year for precious metals also. And a similar scenario in the nearer term view, as well as a potential higher low in November than in July. 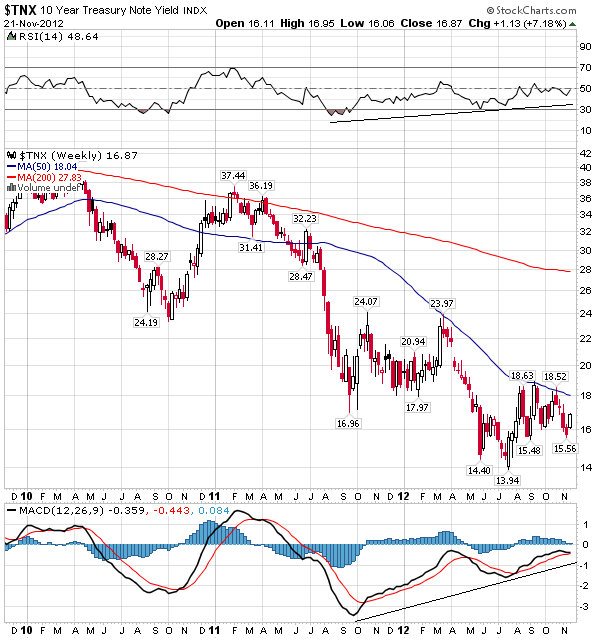 That the mid-year low will hold here is unproven, but I have previously outlined reasons why I believe it will do so, and that it could mark the secular low for bond yields. 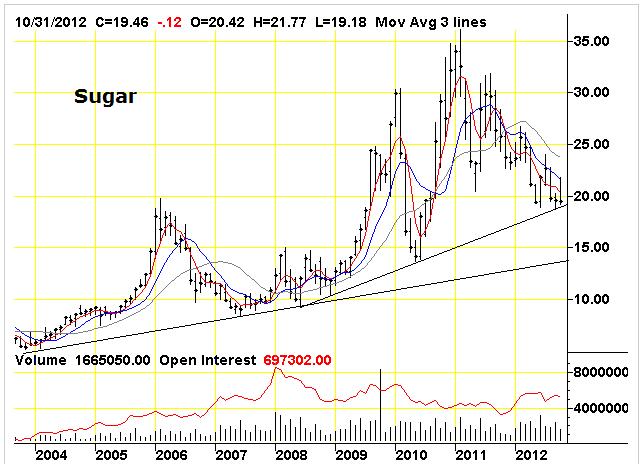 Next I show coffee and sugar, both at extreme low levels of sentiment/oversold. I suggest both are ripe for a bounce here, but whether they can muster new uptrends at this point is unclear. 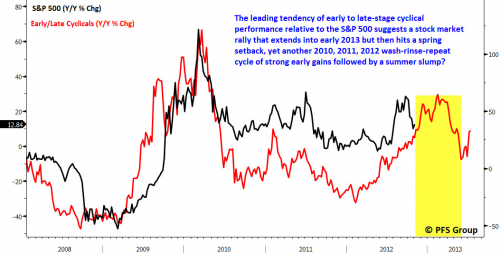 The parabolic moves in both are recent, and therefore more time may be needed. However, if my predictions for secular finales in commodities and inflation come good, then I would expect most commodities to be dragged upwards again. The following chart is an ETF for grains, which were the best performing commodities of mid-2012, due to adverse weather conditions. They have now made a 50% retrace of that upmove and on positive RSI divergence. By Gann, commodities should begin a large upmove as of now, so this could be a suitable point at which to resume an uptrend. In short, in the near term next week, I predict some degree of correction or consolidation in stocks, which could imply pro-risk in general. Thereafter I expect a push upwards into year end, supported by improving leading indicators, positive technical setups, and Gann and seasonals. What would change my mind? Other leading indicators foretelling contrasting global weakness, greater evidence of cyclical stocks topping indicators, or a technical breakdown in key assets, such as a breakdown from the Nasdaq channel. Let me recap on my overall position. 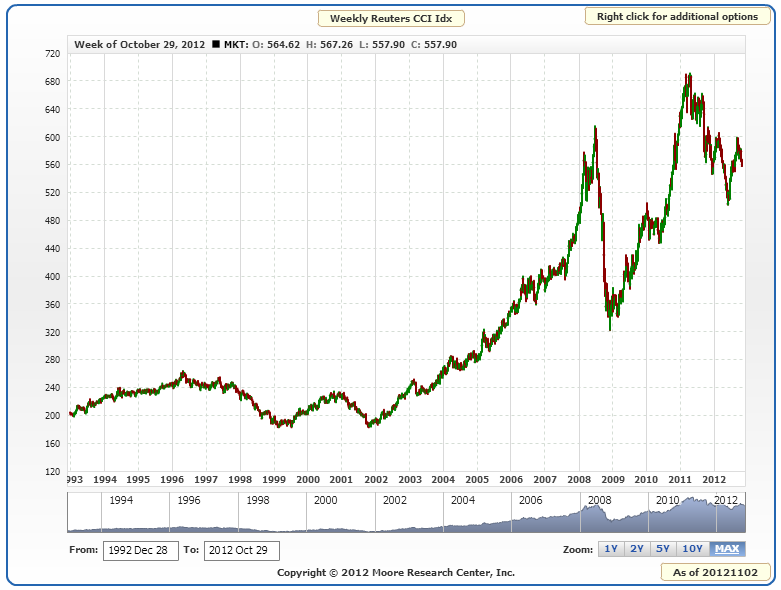 I am long commodities for a parabolic finale into a secular peak in 2013, with my biggest exposure in precious metals. I am long stock indices, largely opened in Q2 2012, looking for a cyclical bull top in the current window stretching into 2013. I have recently added long certain stock indices looking for a longer term hold, where I believe secular bear value has been reached, namely China, Russia, Japan and Austria. And lastly, I am short treasuries, with less exposure than stocks and commodities, also looking longer term for a new secular treasuries bear market. The recent draw down in equities has reduced my open profits – but judge me on my trades once they are closed. A cyclical stocks top is a process, with common characteristics. Large sideways volatility with alternate up down moves as the market gradually rolls over in a period of months, and a double top or higher high where we see negative divergences in internals, such as breadth. As the topping process unfolds, we should see more and more issues at new lows as participation thins, and we should see defensives outperforming cyclicals. Right now, we continue to see cyclicals outperforming defensives despite the falls, we have not seen the trademark congregation of new lows leading into this, and if this is a top, we have yet to see the push back up the highs, accompanied by the telltale weakening internals. I have not blindly held on to long equity positions, but am awaiting the coming together of topping indicators to sell out. Patience, as always, is the key. If a topping process in equities has not begun, then we should need to see improvement in global macro and leading indicator data to support bull continuation following this correction. If a broad commodities acceleration is to take place, then even more reason to need improvement in such data. 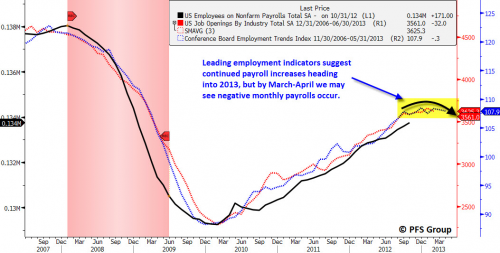 In another twist, we now see signs that data may indeed be improving again. So improvement across the board again, and a big leap in Korea in particular. Next is a chart showing the drop in industrial output globally that has been recently taken place (aggregated for the G7 and leading emerging 7 nations). 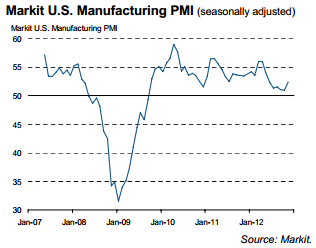 However, the leading indicator here shows an upturn ahead. 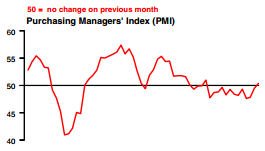 This leading indicator is global real narrow money expansion and precedes economic activity by around 6 months. Global real narrow money supply has been growing since a bottom in April/May, so industrial production should now start to increase again. China’s recent improvement in economic data could therefore be part of a wider pick up in growth globally ahead. For the US, there continues to be mixed data, but the overall picture is represented here by ISI’s diffusion index, which subtracts the bad data from the good, and it can be seen this is currently positive and rising, not the picture of an economy rolling over. 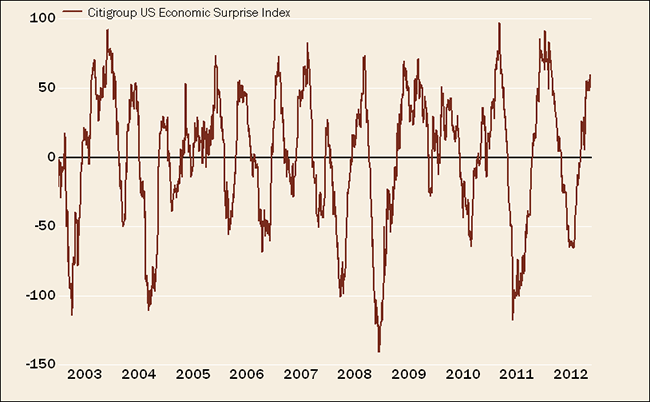 Overlaying this economic surprise index on US stock market performance reveals a current disconnect – either economic data should now rapidly start to disappoint or stocks should reverse upwards – or some combination of the two. So let’s see, but maybe tipping into global recession is premature. It could be that the mid year series of rate cuts, renewed QE and other stimulus measures needed time to have an impact. 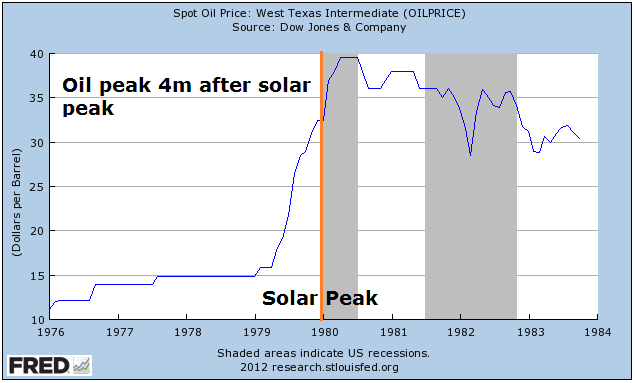 By solar-secular history, a growthflationary finale should be the theme into next year’s solar peak. 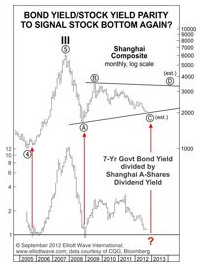 A cyclical stocks bull top should also be accompanied by rising bond yields, which would be more likely under growthflationary conditions. The relationship between 5 and 10 year inflation expectations and real CPI reveals that inflation should pick up as we enter 2013. If global deflation is setting in then that would be difficult to achieve. Lastly, here is the updated Hang Seng chart for interest (click for full size). It recently broke out of its long term triangle and is now backtesting the breakout. Will it hold and push on? Failure here would be particularly bearish, as a return into the triangle would suggest a fake out had occurred, with the possibility of a subsequent breakdown the other way. 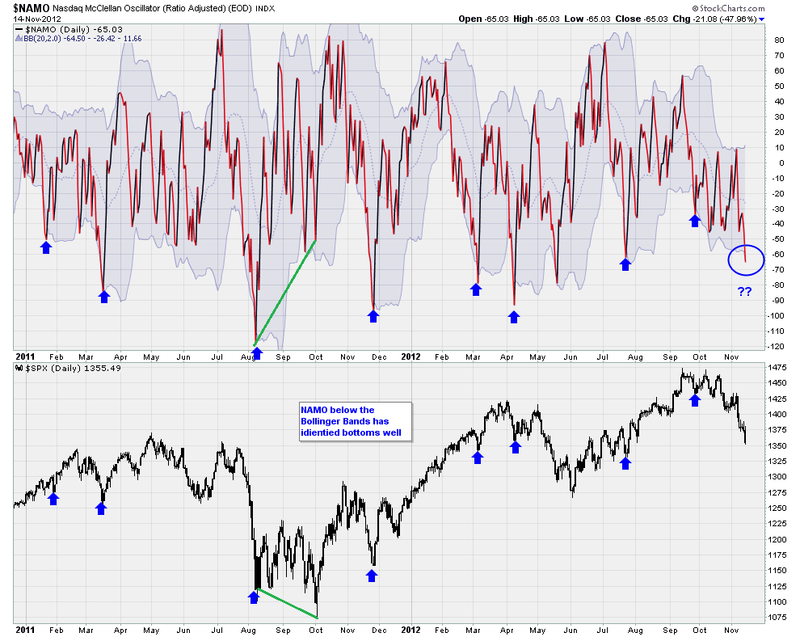 Out of the lower bollinger band and sufficiently oversold to suggest a bounce right ahead. The question is whether US stocks are a buy here or whether they need to print a lower low following a relief bounce with a positive Nymo divergence – see green highlights. To add to this, Sentimentrader reveals that the majority of US stock market sectors are at bearish sentiment extremes, and stocks above the 50MA have reached the lowest range. So there are reasons to expect a bounce in US equities as early as today. The unknown is whether they will reverse course, or merely make a relief bounce before a lower low with positive divergence. Looking wider, daily sentiment index extremes are currently showing for treasury bonds (extreme bullish) and Nikkei, soybeans and coffee (extreme bearish). This suggests a bounce in US stocks may well be part of a broader bounce in pro-risk and away from safety. We have just seen a lunar inversion – stocks declining into this week’s new moon. That gives potential for a brief relief rally before a lower low into the week commencing 26 November – the week of the full moon. That would roughly tie in with the Gann predicted take off point for commodities (and reversal in stocks) around 21 November. Alternatively, lunar inversions have sometimes historically meant trend changes, so there is the potential to rally from here and not look back, which would be in line with the presidential seasonality and geomagnetism I presented earlier this week, and also close enough to the Gann take off. 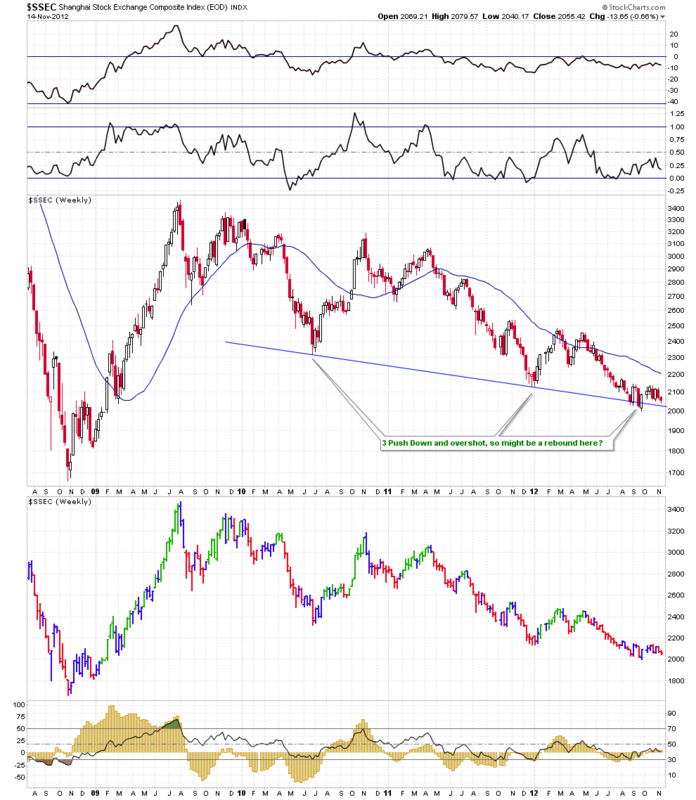 Both Chinese stocks and US treasury yields are still trying to carve out bottoms, both holding above their lows and with the potential to make inverse H&S patterns, and doing so on extreme cheapness. Potential bottoms only of course, but with justifications. Russian stocks have also dropped further since I opened a position last week, now at a p/e of just 5.8. 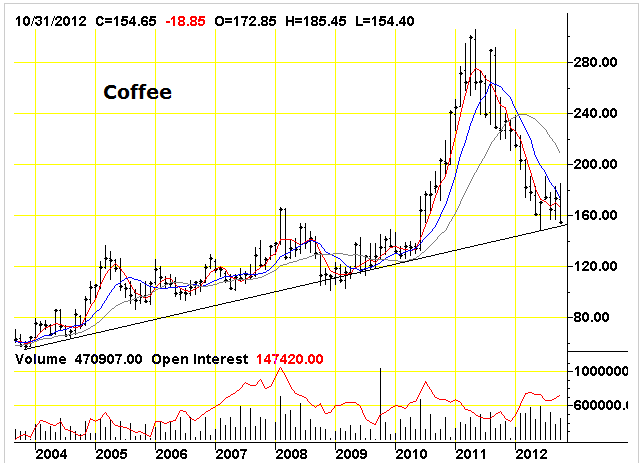 Coffee public sentiment is at an extreme low not seen since 2001. In short, there are a few candidates in my mind to play a bounce in pro-risk – and that includes US equities – and I’m just weighing up where and if I want to add today. The ‘if’ part is related to the potential for a lower low ahead, where a positive divergence in breadth or RSI is required. 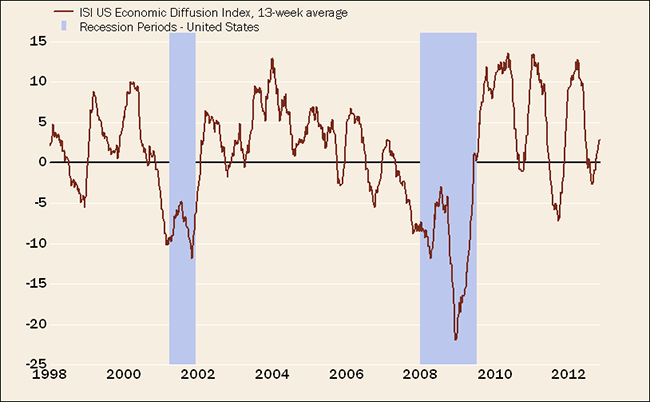 We do not as yet see a washout in other indicators, such as sentiment surveys. These might also suggest caution. However, I maintain that if this is a topping process in stocks then we should see up-down volatility near the top, rather than the kind of deep cleansing washout that enables a bull market to continue. Will post in the notes if I add positions. What could give commodities such a thrust? Strengthening in China for one, and we see this in the latest data. Industrial production rose 9.6% year on year, retail sales beat expectations at 14.5% year on year, and auto sales rebounded strongly from September’s weak number. 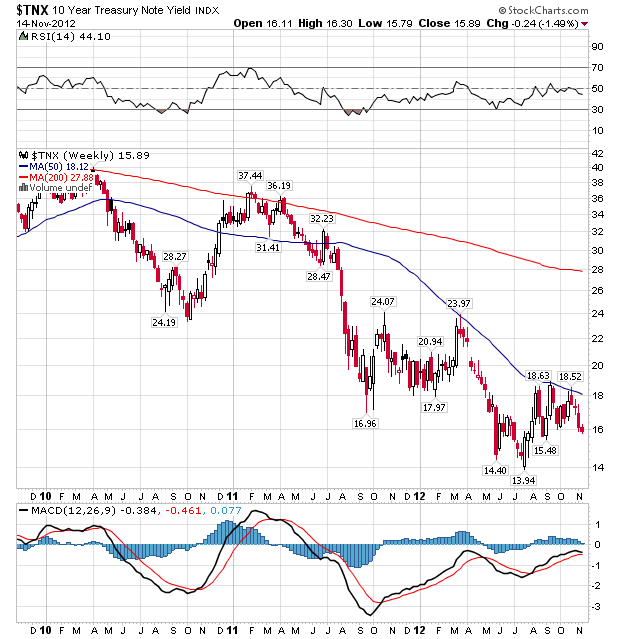 Commodity technicals could also assist, with gold having bounced at the 200MA again which has largely supported the secular gold bull to date, soybeans having retraced sufficient of their mid year gains to reach just 8% bullish daily sentiment, and coffee having reached an all time record speculator short position. Potentially we could see pro-risk wash out a little more in sentiment before take-off next week, but I predict the next move will be a rally in both stocks and commodities whereby equities (globally speaking) re-reach for their Q3 highs, but make negative divergences in internals (if they are to be topping out), whilst commodities outperform upwards. I am watching leading indicators to judge whether there is ‘sufficient’ growthflation ahead to enable this scenario. The rest should be fulfilled by the influence of solar maximum activity on humans collectively. 2013 is the big test for my solar theories. I leave Kuala Lumpur tomorrow for 6 nights in Penang, continuing to explore Malaysia. Today’s exercise is a 3-way cross reference between price-book valuation (p/b), price-earnings valuation (p/e) and cyclically-adjusted price-earnings (CAPE) valuation of stock indices around the globe. I believe we are in a gradual process of transition from a secular stocks bear to a secular stocks bull globally, with the nominal low already achieved in 2009 and the momentum ‘go’ point likely 18 months hence or so. I am on the look out for timely points to invest in stock indices that reach p/es/CAPEs sub 10 and p/bs of around 1 or lower, as these mark secular extreme low valuations. 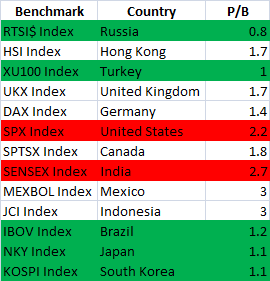 The first table is a list of some of the main country p/b ratios, as at the end of October 2012. Green – cheap, red – expensive. The second table contains a more comprehensive list of countries, this time valued by CAPE as at the end of October 2012. They are in order of valuation from green/cheap to red/expensive. 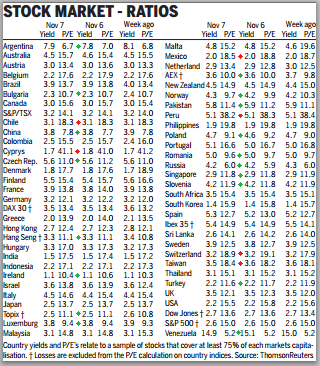 And the last table is right up to date as of the end of yesterday, showing countries valued by regular p/e and also by the yield of the country’s index. Peer at this to spot green markers against cheap countries and red against more expensive. It should be noted that because we are reaching towards the end of a global stocks bear market, there are very few countries that are truly expensive, as the historic average p/e is around 15-16. What are the main takeaways, when cross referencing? Pawel mentioned Turkey. It is cheap by p/e and cheap by p/b (though less so by CAPE), and this is after rising 40% over the last 12 months. Japan, particularly the Topix, is also cheap by both (though slightly less so by CAPE). Ireland looks to be the pick of the PIIGS, with a cheap p/e and ultra cheap CAPE (although it is yielding little). But there is one winner, extremely cheap by p/b, CAPE and p/e and yielding 4.2% to boot, and that’s Russia. The Russian stock index is most weighted towards energy, so aside the political risks, the key question is whether you believe energy prices can hold up ‘well enough’ looking into the future. I’ve opened a long position in JPM Russian Securities today. On the flip side, Cyrpus and Peru are the notable ultra expensive countries, but two other countries stand out because of being relatively expensive to the others by all 3 measures above, and that is India and the USA. I continue to await the forthcoming rally in equities – which should occur whether this is a topping process or a bullish continuation, and if evidence grows for a cyclical bull top, I would look to exit my SP500 stock indices positions. 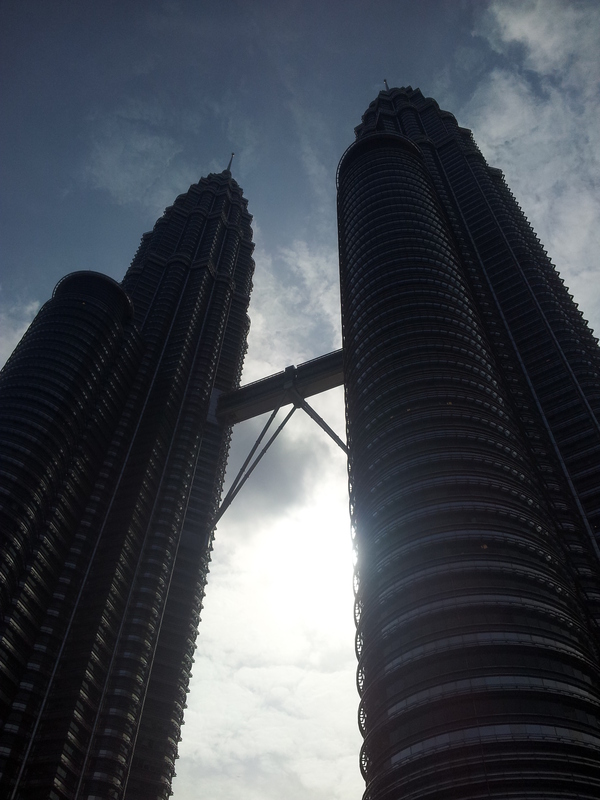 Today we head into Malaysia for 2 nights in Melaka and then on to Kuala Lumpur. 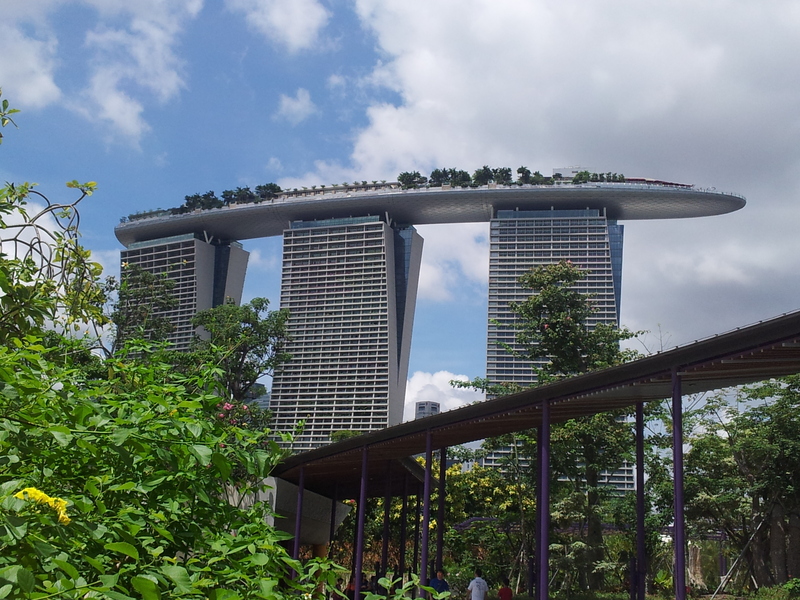 Singapore – what a great place. One of the notable few where the lack of land and natural resources has in no way impeded its economic development. It may have a hybrid ruling system, not fully democratic, but it is clear the government has achieved great things for the city-state. It is the 4th top financial centre in the world, the 5th largest trading port, and has a deliberately varied economy so it is not too reliant on one sector. It is amongst the least corrupt countries in the world with a very high standard of living. 20% of its inhabitants are millionaires, the highest ratio for a country. It is in the top 10 countries in the world in terms of its financial reserves and is a world leader in technology. There are rules to adhere to – no littering, spitting, jaywalking, racist slurs, and more – and capital punishment for certain misdemeanors, but the net result is a country that is very safe, respectful and clean. Customer service is also of a very high standard and feels very genuine. For me personally, the English language, left-hand driving and English products around gives it an instant familiarity – all thanks to the colonial history – but the 30 degree constant heat, exotic plants and animals, and multi-Asian influences made it feel equally exotic. There are now 5 million people living in the 274 square mile land mass, but is doesn’t feel overcrowded, but vibrant, and it is sufficiently cosmopolitan not to stand out as a tourist. I spent an evening with a portfolio manager who lives here and he stated that the population had really grown over the last decade thanks to an influx of foreigners. 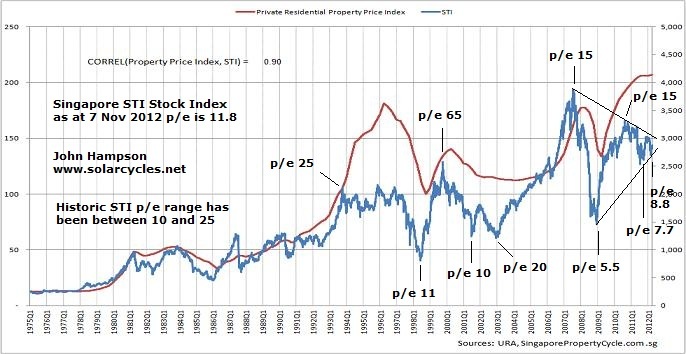 The result has been a ballooning of real estate prices, shown by the red line in the chart below. The chart also shows the Singapore STI stock index, and I have added the price/earnings valuation history at the key peaks and troughs. It can be seen that there was one historic episode of a speculative mania to valuation excess, around 2000, tying in with the dot com peak. Since then we can see the global secular stocks bear market unfolding in terms of gradually cheapening valuations, even though the nominal index has an upward slant overall. Like other key indices, such as the Hang Seng and UK FTSE, it has formed a large triangle, which I have highlighted, and is likely to resolve one way or the other soon. I suggest, like the other indices, that this is going to resolve to the upside, with a breakout, pullback to the midpoint (triangle nose), and then a couple of years hence, break upwards from there into momentum secular bull. The p/e valuations achieved at the 3 triangle low points of between 5.5 and 8.8 are all extreme secular bear low valuations that suggest sufficient secular wash out to enable a secular bull. 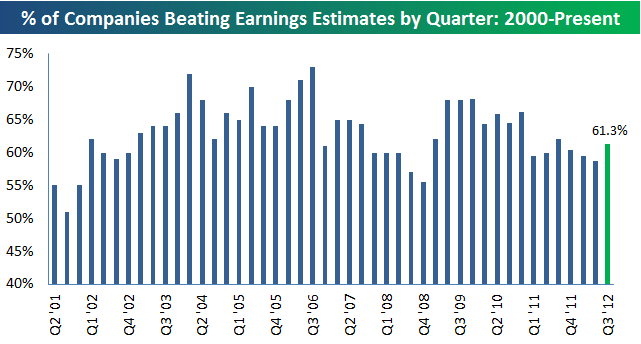 Once again, this casts doubt on any deep cyclical bear ahead, but more likely shallow. At current p/e of 11.8, the index is at the cheap end of what has been largely an oscillation over the years between 10 and 25. I have opened a single long position in the STI Index today, and will add to it on any significant falls. Some pics below. 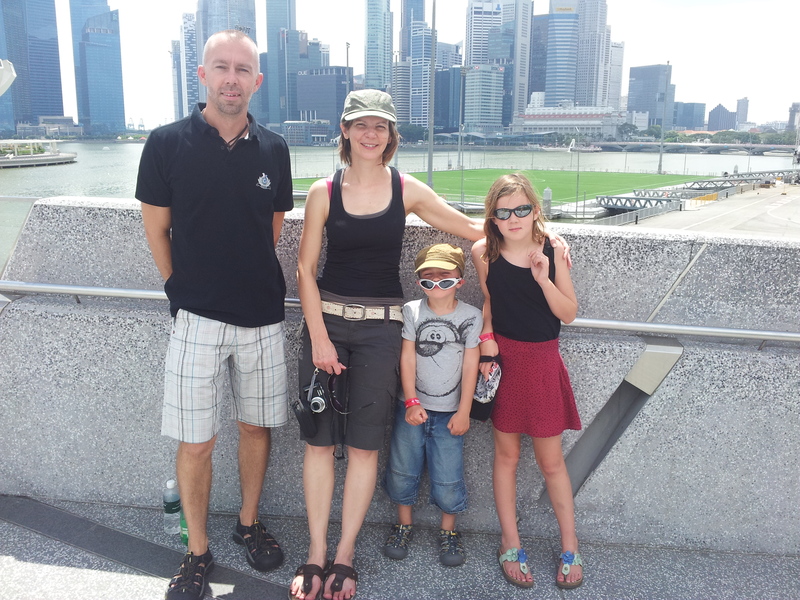 Family Hampson in central Singapore. The amazing engineering of the Marina Bay Sands building. 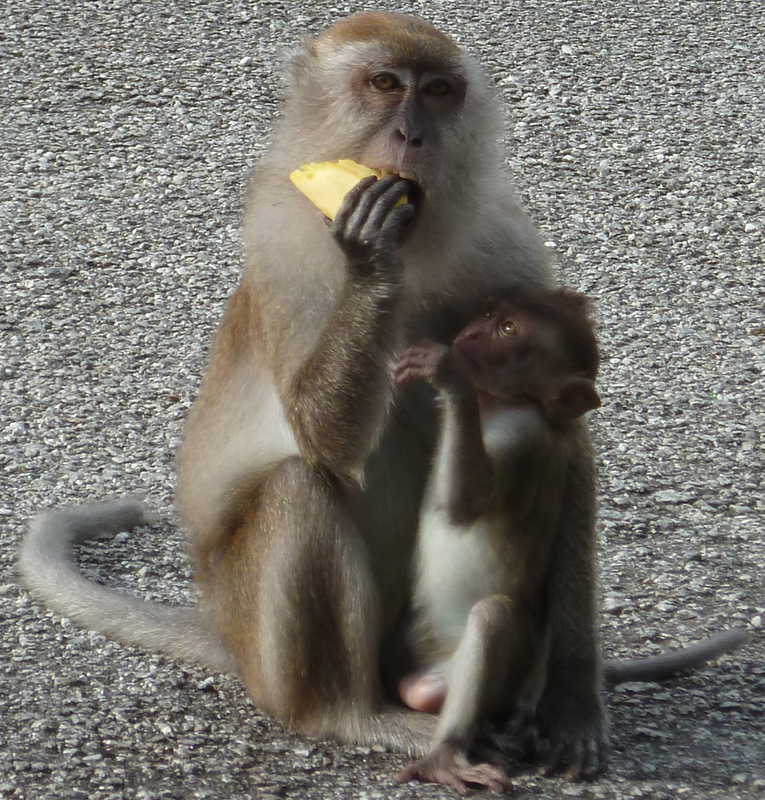 And an experience I hadn’t imagined for the kids – swimming with a monkey at the Shangri La Rasa Sentosa – thanks to the monkey for that freebie!